When the U.S. entered World War I, Fred J. Gorham was a 40-year-old bank officer in Henderson, Kentucky, with a wife and young daughter. 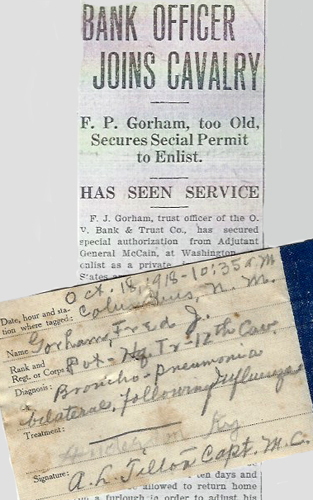 But Gorham had also served as a cavalry officer in the Spanish-American War, and believed that his experience would help the Army in training recruits. But twelve days after that letter, and having assured both his wife and mother that the camp was healthy, Gorham was dead of pneumonia following an attack of influenza. This veteran of one war and volunteer for another was the victim of a pandemic that, over the next two years, would kill millions worldwide. Gorham’s remains were interred in Louisville’s Cave Hill Cemetery and his name added to the honor roll of Henderson County’s “Immortal Dead.” The Henderson Daily Gleaner‘s list, in fact showed more of the county’s sons losing their lives to disease than to battle wounds. Fred Gorham’s letters and papers are part of the Manuscripts & Folklife Archives collections of WKU’s Department of Library Special Collections. Click here for a finding aid. For more Spanish-American War and World War I collections, search TopSCHOLAR and KenCat. It was a disaster rarely spoken of today, yet it killed more Americans than all of our 20th-century wars combined. Over 10 months alone in 1918, a vicious strain of influenza took the lives of more than half a million in the United States, and some 30 million worldwide. Today, as many obtain their routine vaccination in anticipation of flu season, it is difficult to imagine such a sudden and destructive plague. 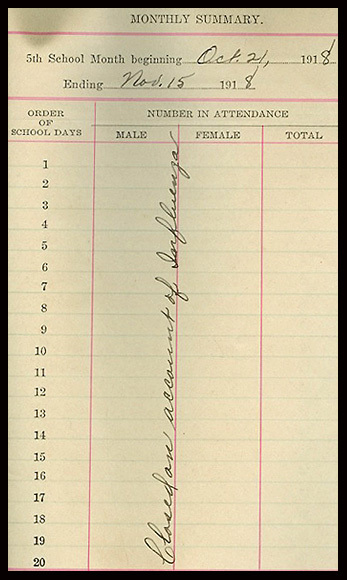 Scottsville teacher Eva Dalton’s monthly report during the 1918 flu epidemic. But evidence of influenza’s shadow, especially in the terrible autumn of 1918, is preserved in several collections in the Manuscripts & Folklife Archives section of WKU’s Special Collections Library. Some Kentuckians seemed to wait in resignation for the illness to strike. Returning home to Auburn, a correspondent wrote Smiths Grove farmer Carlos Moore of a passenger “on the train last night almost dead with ‘Flu. '” She was planning another trip the next week, “if I don’t take the ‘Flu. '” Butler Countian Stella (Phelps) Minton and her family became so ill that her 7-year-old son had to assume all household duties. Grief-stricken when two other sons died, Stella and her husband kept a small trunk filled with the boys’ belongings for the rest of their lives. 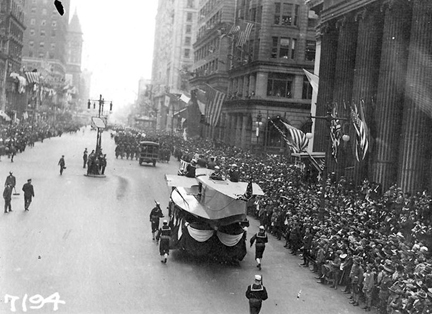 The flu, of course, gave soldiers and their families additional cause to worry about one another in the closing months of World War I. Serving overseas in December 1918, James McWherter heard from his father in Monroe County that the “The flu is still here, some are still dying with it.” Drucilla Short wrote her brother George Harris in October that “influenza has put a ban on all churches, theaters and schools.” Unfortunately, Drucilla’s letter was returned, for her brother had also lost his life–not to the flu, but to battlefield wounds. 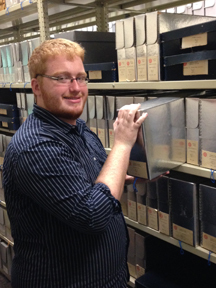 Click on the links to access finding aids for these collections. For other collections relating to the 1918 influenza epidemic, search TopSCHOLAR and KenCat.